To some, mowing the lawn is an enjoyable, almost therapeutic, task. To others, it’s a task they dread. For those, a new battery-operated mower, much like the popular Rumba vacuum cleaner, may be the product of your dreams. “The ‘automower’ actually isn’t a new concept. They’ve been used in Europe for a few years, but they haven’t been widely adopted in the U.S. to this point,” said University of Georgia Cooperative Extension Turfgrass Specialist Clint Waltz. Waltz is currently using an “automower” on the lawn just outside the new UGA Turfgrass Research Facility on the UGA Griffin campus. The Husqvarna mower is on loan from Georgia sod producer Super-Sod, so Waltz can observe and evaluate the concept of “continual” mowing, he said. When it comes to environmental impact, the “automower” doesn’t use fossil fuels and doesn’t stir up dust like conventional mowers. Maintenance costs do not include oil changes or new spark plugs; it only needs new blades every three to four months at a cost of about $20. With labor being the biggest challenge in the landscape industry today, the “automower” may fill a need, Waltz said. “When labor becomes difficult to find, or too expensive, innovation occurs. The ‘automower’ doesn’t stay home from work because of a case of brown bottle flu or complain to the department of labor about its continuous working schedule,” Waltz said. “In tight areas of the lawn where a conventional mower may have to make multiple passes, compacting the soil and increasing traffic and wear, the ‘automower’ can mow more efficiently and decrease compaction,” he said. The auto-mower also reduces safety concerns for drivers of conventional mowers when mowing steep slopes or hard-to-mow areas. And, it can mow areas normally cleared with string trimmers. 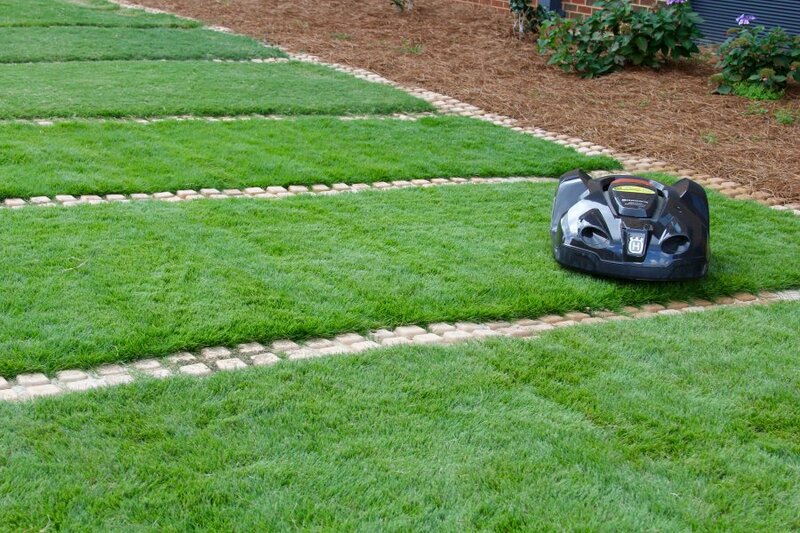 Since the mower removes no more than a third of the leaf at a single mowing, no thatch or surface clumps accumulate on the lawn. “This method of mowing also doesn’t overwhelm the soil microbes, making them more efficient at returning organic matter to plant-available nutrients,” Waltz said. That simply means there could be less need for fertilizer. Some “automower” models come with lights that could act as a wildlife deterrent, Waltz said. “The random mowing pattern may act as a deer deterrent within the landscape. It’s not substantiated, but there have been comments that landscapes with the ‘automower’ have fewer moles and voles,” he said. For more information on turfgrass research at UGA, go to www.GeorgiaTurf.com.